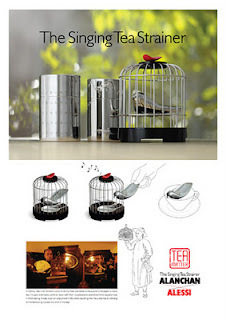 One of Interior Design's Best of the Year Award Winners is the Singing Tea Strainer. The beautiful bird inside of the cage is a wonderful piece to have on display. When the tea strainer (the bird in the birdcage) is lifted out of the cage, a chirping sound can be heard. Tea lovers, bird lovers and just fabulous decor lovers will be thrilled with this fantastic find!